The forest north of Cataloochee Valley in the Mt. Sterling watershed has recovered nicely from logging activities a century ago. It is dense, rich and diverse… a verdant testimony to Nature’s ability to reinvigorate herself. This hike starts at the north end of Little Cataloochee on Mt. Sterling Road and meets Long Bunk Trail a mile later. Long Bunk is a near 4-mile path that winds through cove and hardwood forest until it meets the Mt. Sterling Trail. Along the way you have an appointment with historic artifacts, and with dynamic woodland. Ken and I enjoyed Long Bunk on Monday, August 23, 2016 beginning at 8:30AM and ending about 2:30PM. Our plan was to take the Little Cataloochee Trail to its junction with Long Bunk, then proceed to the end of Long Bunk and turn around. Hike Rating: Moderate. Up and down, but not particularly strenuous. Trail Condition: Fairly good. Rocky in places. Rock hops over minor streams. Starting Point: Little Cataloochee trailhead on Mt. Sterling Road. Trail Traffic: We encountered two other hikers, right as we were wrapping up. How to Get There: From Asheville, NC take I-40 west to Exit 20, Hwy 276. Turn toward Maggie Valley, then take the first right onto Cove Creek Road. Stay on Cove Creek Rd. to the entrance to Great Smoky Mountains National Park at the Cataloochee Divide. The last mile up on Cove Creek Rd. is gravel. From the Divide it is three more miles of very curvy, downhill gravel road to the junction with Mt. Sterling Rd. and Cataloochee Rd. Go straight onto Mt. Sterling Rd. and proceed another 6 miles to the Little Cataloochee Trail on the left. You will cross a bridge over Cataloochee Creek at the gauging station before reaching the trailhead. If you haven’t yet been to Little Cataloochee, I recommend you walk the extra mile past Long Bunk first, to see the restored cabins and church that are throwbacks to a time of simpler, but harsher living. My first experience there was a few years ago coming from the opposite direction on the Little Cataloochee Trail. We had a grand time that day, seeing all the 19th and 20th century homesteads that had to be abandoned so we could enjoy a national park. But that was then, and this is now… and our adventure on this day was to be Long Bunk Trail. It turns right and climbs a hill a mile from the northern Little Cataloochee trailhead on Mt. Sterling Road. Speaking of Mt. Sterling Road, it is quite the trip. You can get there from either end, whether it be Big Creek near Waterville at the NC/TN state line on I-40, or as a continuation of the twisty gravel road that comes down from Cove Creek Gap to Cataloochee. You can even hike all the way there on the Asbury Trail, but we weren’t up for a 25 mile round trip, so we drove Mt. Sterling Road. Along the way we saw a couple additional trailhead markers where you can join the Asbury Trail if you desire. Before permanent settlement in Little Cataloochee, the Long Bunk area was used by Haywood County herders to turn out their cattle and hogs. The swine would feed on the abundant nuts that fell from the giant trees standing below Long Bunk Mountain, including hickory, oak and buckeye. I read an interesting story about this that helped me understand a term I’ve been hearing since my youth — salt-lick. A couple times a month the herders would visit their hogs in the woods and provide salt, by spreading it on the ground, or in logs that were known as licks. Hence, salt-licks. Who knew? Now I do. Apparently too, before this was called Long Bunk Trail it was known as Pig Pen Trail. More about hogs in a bit. 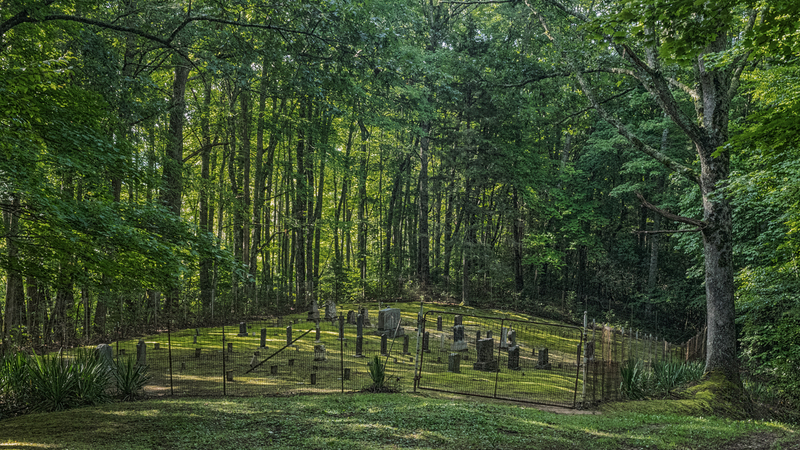 It is a little less than a quarter mile up Long Bunk Trail from Little Cataloochee to Hannah Cemetery. This burial site has more than 50 markers and is surrounded by wire fence. Over the years, the ground has become covered with a bright green moss, so the appearance is quite appealing, and the site is easy to maintain. In addition to Hannah, the predominant family, you will also see other pioneer names here that you’ll notice all over the Smokies. Smokies lore tells us that a bell would ring and ring whenever anyone died in Little Cataloochee. If you listened carefully, you could count the number of years they lived. Continuing north beyond the cemetery, Long Bunk changes from old road bed to single track trail, climbing gently. Another quarter mile beyond you reach an oak grove and the first of many remnants from old homesteads. Keep your eyes peeled on each side of the trail for indications. We went off the trail about 25 yards and found an old gas lantern and a bucket, as well as a patch with many summer wildflowers including coneflower, thistle, lobelia, and ironweed. The next half to three-quarters mile levels off somewhat, as it passes through mixed hardwoods. There were already nuts on the forest floor, primarily acorns, with the occasional hickory and buckeye. I’ve heard that Long Bunk Trail can be like walking on marbles later in the season as the trees totally shed their mast. I could see why he thought it was deer at first. The hide was the same color. But the short legs and the tusks on his face made it clear this wasn’t a deer. Before we could really react, with cameras or protection, off he trotted away from us. I’ve always heard about the Smokies’ hogs, but this was my first… Ken too. We were excited to see one, but equally delighted that it wasn’t a pack that charged us instead of running away. For the next 10 minutes we kept the eyes in the back of our heads open to make sure he didn’t go get his buddies and return for a surprise attack. Silly lowlanders. Soon after, we relaxed again and got back to completely enjoying the forest. Dude Branch was lined with thousands and thousands of touch-me-nots, or jewelweed, both yellow and orange. Over the next mile the trail narrows even more as it meanders up and down, west and east. I could see where it could perhaps get overgrown in spots in late summer, but we were fortunate to be there just a matter of days after trail maintenance came through and trimmed a foot-wide buffer on each side. Thank you folks. Just short of the 3-mile mark the trail crests a ridge that is covered with an oak grove, some with trunks as wide as 4-5 feet. It’s a beautiful sight. Beyond the crest, the trail gently descends into a luscious cove as you approach the two forks of Correll Branch. It’s a bit of rock hopping over the two, but nothing that will get your feet wet. Between the two branches is an amazing grassy cove that looked like an ideal location for lunch. We pulled up a log and enjoyed sammiches and apples, and near complete silence. Correll Branch Cove is a remarkable place. This spur trail in the picture goes to a small clearing. After the second crossing of Correll Branch it is a steep quarter mile up to the junction with Mt. Sterling Trail. If you so choose, you can turn right for a half mile to Mt. Sterling Gap and another meeting with Mt. Sterling Road, or you can turn left and climb, climb, climb 2.3 miles to the tower at the summit of 5,842′ Mt. Sterling. We were already sweating enough on this humid August day, so no more climbing for us. We decided instead to do some exploring of the hillside above the cove where we had lunch. We came across quite a bit of evidence of the homestead of the David Nelson family, including a moss-covered stone foundation and walls, and a spring house just above Correll Branch. We also discovered a cook top from an old cast iron stove that had the model number enblazoned in the iron. Neato! The return journey is mostly downhill, so the walking was easier. As the day had progressed, more mushrooms and other fungus had popped up along the route, and more wildflowers had opened their buds into full bloom. I’m told that Long Bunk is also a delightful trail for Spring wildflowers including may apple, dwarf iris, and bloodroot. We had not seen another soul the entire day, save for a wild boar, a few squirrels and snails, and a bunch of woodpeckers. When we reached the junction with Little Cataloochee we finally encountered a very friendly couple who were also out enjoying the lovely day. We stopped and chatted for about five minutes. They loved hiking in the Smokies just as much as Ken and I do. We said our goodbyes and returned the final mile on Little Cataloochee Trail back to the car, recounting all the enjoyable history and nature we had found along the way. 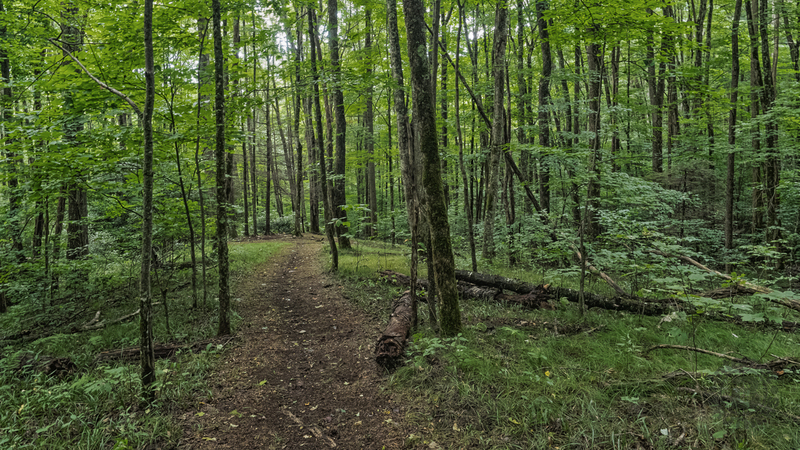 Summarizing, this is a beautiful forested hike through former settlements of Little Cataloochee that would be great for the whole family and is only of moderate difficulty. Expect to see plenty of remnants of pre-national park living, mountain streams, and an absolutely stunning forest. I would offer one point of warning. As evidenced by our meeting with a feral hog, you need to be aware that they do inhabit this region. Just be diligent with your safety precautions and all will be well.